From 5/10 through 5/16 participating Lowe’s stores will be offering a 11% Mail-In Rebate on ANY purchase. Simply submit all required information to receive this rebate, loaded on a Lowe’s Gift Card. Simply complete the short form to snag your sample and allow 4 to 8 weeks for delivery. You can get this deal using McDonald’s app. Just click on the “View Deals” section of the app to find this offer, customize your order, apply the coupon and pay. Valid through May 13th. Use promo code MOM to score some great last minute gifts. Select store pick up or add a cheap beauty item to avoid shipping costs. And many, many more to choose from. Get Oral-B toothbrush set from itechdeals for only $5.50 plus free shipping. Bring the family and enjoy dinner at Long John Silver’s this week! 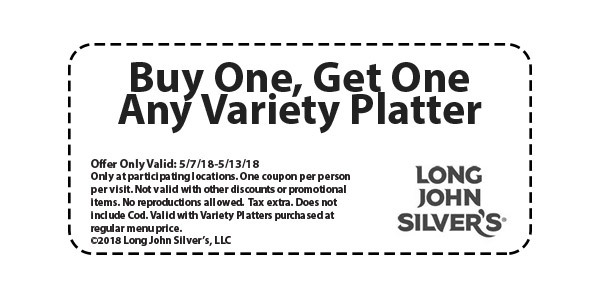 With this coupon for Buy One Variety Platter, Get one free–you can afford to celebrate mom every day!! At participating locations. One coupon per receipt. See restaurant for details. Tax where applicable. Free shipping on orders over $35 or select in store pick up to avoid shipping fees. Riding a trike is always fun, so of course, no one wants to stop! The Disney Frozen trike from Huffy features the exclusive Dual Power to make sure you can keep going — even if the battery runs out during a ride. Simply turn the Power Dial to change from Battery Power to Kid Power so the child can pedal the trike to keep going. It’s that easy! The Disney Frozen trike moves in forward motion at an easy speed for young riders. The sky blue trike features graphics of the favorite characters from Disney Frozen including Anna, Elsa and Olaf. The six-volt battery is convenient to recharge. From Huffy, We Make Fun. For a limited time only, you can score a FREE 8×10 Photo Print at CVS ($3.99 value). At checkout use promo code MOMPRINT and select in-store pick up to make this completely free. Works best on desktop site and it may not work on their app. Valid through Wednesday (May 9th), you can score Unlimited Soup, Salad and Breadsticks Lunch for just $6.99! This coupon is only valid until 3PM each day. Note that there is a limit of 1 coupon per check. Bath and Body Works $3 Hand Soaps + $10 OFF $30, Buy 10 $2 Each! with code S3TNTR.